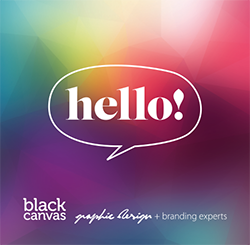 At Black Canvas we are very aware that our portfolio is our biggest asset. Everyday someone phones, emails, drops in, or enquires through our website after checking out our online gallery. This is the biggest blessing to us because, by nature we are shy, introverted and not ones to sell ourselves or blow our own trumpet. So how do you overcome the great divide between natural born UN-salespeople and getting work through the door? Our tool of choice is a powerful portfolio. One that sells for us. Its big, bold, extroverted and out-there – all the things that our personalities are not. This is true of any business, and in no way exclusive to our industry. It doesn’t matter if you are in construction, consultancy or cake decorating… evidence of your experience is a powerful tool when marketing to potential new clients. By showcasing what you can do and what you have done previously, you establish credibility in your industry. A portfolio is testament of your abilities and helps reach those who might want to engage your services or utilise your product for the first time. In today’s new world of buying and selling we have so much choice before us. Before a commitment to purchase is made, there now comes an important phase of the buying process… research. During the research phase, consumers seek confirmation of their purchase decision through reviews, testimonials, case studies, imagery or videos. A big investment of time and energy goes into preparing a portfolio - but the rewards will make it all worthwhile! So, take the time to record the work you have done. If you are an architect, schedule an appointment to take photographs of the building you designed at a later date when landscaping has been established. If you are a cake decorator, take a moment to record your creation before it gets devoured. Better yet, why not request a few photos be taken at the event that shows your cake at centre stage and the delighted looks on the faces of guests. If you are a hairdresser, see if your client won’t mind getting before-and-after shots to share on social media. Show others the transformation you can create by a visit to your salon. It is all about inspiring others with what you can do and telling them about the impact of your product or service. If you are in an industry where visuals won’t work, use words to paint the picture. Case Studies, for example, help tell the stories of your customers by giving a real-life scenario. These experiences can be compelling because they are engaging and help relate a potential client to what you can offer. Describe who your client is, set the scene of their situation or difficulty, finally describe how your product or service helped save the day. The inclusion of testimonials can provide additional evidence. If those testimonials come from companies, display their logos to further enhance credibility and connection. Having a third party endorse your brand for you, can mean a great deal more than when you say it yourself. Your portfolio of past experience is a powerful marketing tool and time needs to be invested into showcasing what you can do. We do this by utilising moments of down-time in our business and taking advantage of opportunities as they happen. By having a clear focus and defined procedure in place – any member of staff can be called upon to help achieve the end vision of a powerful portfolio. Start 2015 with a plan and get all team members on board with the end result. Use quality imagery and keep design simple, cohesive and in line with your brand. Don’t leave customers guessing as to what it is you do, who you have helped previously and how you might be able to assist them into the future.